Rust, Germany – BackupAgent, the leading provider of cloud backup software, today proudly announced the release of APS 2.0 package for Parallels. BackupAgent and Parallels have been working jointly on the APS 2.0 package for the cloud backup service. BackupAgent is the first backup vendor to build an APS 2.0 package and all its Partners can start testing right away. What does the new BackupAgent APS 2.0 package do for a Parallels PA partner? 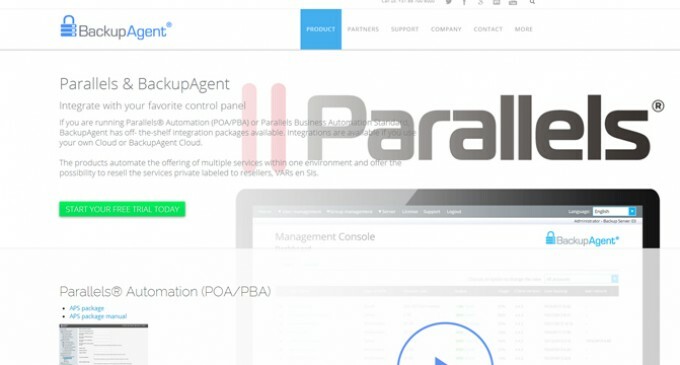 BackupAgent offers a deep integration with Parallels Automation for customers and service users. We have also optimized the user experience and customers can now provision and monitor cloud backup subscriptions from a single UI view, with intuitive and fast navigation. The new package auto-detects existing service users and can provision the cloud backup service with a single click. Also, service users will be able to download, install and monitor the agent software. BackupAgent invites new and – more than 50 – existing Partners who use Parallels Automation to beta test this new package. Please come to our booth at the WHD.global near the main entrance to talk about the possibilities and start using APS 2.0. If you want more information about the BackupAgent APS 2.0 package, please contact us. BackupAgent was founded in 2005, as one of the first cloud backup vendors around, and is a privately held company with headquarters in Delft, The Netherlands. BackupAgent’s cloud backup technology is used by (managed) service providers, hosting companies and telcos in over 50 countries around the world. BackupAgent was ranked 8th on the Deloitte Fast 50, the list of fastest growing technology companies. Research, evaluate and learn more about cloud hosting at FindMyHost.com.